I Must say, on a personal level i am thrilled to come away from St Andrews with three points and three goals. The memories of sitting in the stands last season was going through my mind at half time when we were 1-0 up and i was praying for a second goal. At St Andrews, there are corporate boxes right behind us and most of them have home fans in, so therefore, last season, we could see them celebrate at the final whistle and that memory stayed with me, so it was so nice to get some sort of payback. Off Course, the Eduardo day is still in our memories and hearts too so to get the victory was vital. The chant of the day for me was 'We got Cesc Fabregas......Uve got Lee Bowyer'! and that was sung quite a few times during the game and after it! But now that game is over and we move to the next game and that is another huge game. Every game seems huge at the moment and i hope a similar day to Chelsea is what we get. With the team playing with freedom and pressing the ball as well as they did last Monday and off course the fans playing there part because everyone was signing their heart out last Monday. A win against City would mean an amazing Christmas period and another win in a big game would do even more for our confidence. 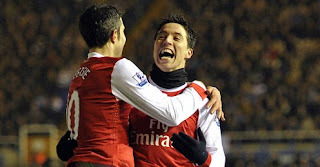 great blog n i jst wanna ask u is it me or song ply deep like last season when Walcott, nasri,rvp n fabrigas ply together? I remember like you standing watching the last gasp goal last season at B'ham! This time Macleish and some of the thugs he has collected in his team were taught a lesson in footballing terms. You have a good blog and I have started my own blog on Arsenal too. Well done! Baroksion, Song has certainly adapted in game in the last 2 days, i would say his choosing when to go forward and when not too and it seems to be working as he was outstanding in both games this week that he played in. Kubla, many thanks. Good luck with your blog too.